ServiceLance provides you with everything you need to find and provide services within your local areas of residence and business, whether you are an Individual or a Business owner. ServiceLance goes far beyond the basics of seeking and providing of services and includes several value-added features that are unmatched in the freelancing arena. New and innovative features will be added consistently to the site to continually provide a rich user experience. Unlike most platforms on the internet today, ServiceLance doesn’t require you to be an owner of a business and recognizes that people who don’t own business certainly have skills that they can heavily profit from. It is legal and acceptable in many countries for individuals to work for themselves. Setting up businesses can be complex, expensive and painstaking, especially when you are starting out. You may prefer to work for yourself, or you prefer to work on a part-time basis, or you are not able to setup a business for reasons beyond your control, or even if you have become victim of the recession and lost your job / business - ServiceLance has a place for you. ServiceLance is free to use for both Service Providers and Service Seekers. There is no catch, no hidden demands for fees or charges. Period. All of the features listed on this page can be performed within one powerful User ID. You don’t need separate user ID's to seek and provide services anymore with ServiceLance. If you think someone you know can do a job, just click on the tell a friend link and fill in the email details. ServiceLance will notify your friends and provide them a link on your behalf so they can register and quote for the job. Interested in a job and want to mark it to track it in the future? - Simply add it to your Watchlist and ServiceLance will notify you before the job expires. You can easily add Providers to favorites for quick & easy access to Provider Profiles in the future. Adding Service Providers to favorites is particularly useful if you like to get work done with specific providers so you do not need to search for them again. 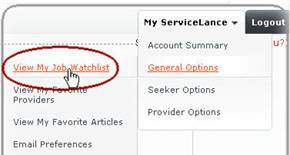 You can even add Articles of your interest written by ServiceLance Providers to your favourites. This provides easy access to information produced by the Providers & proves to be a testament of Providers skills for quick future references. Emails from your subscribed sites can become a nightmare by cluttering your inbox with huge numbers of emails. ServiceLance provides periodic summaries of activities that relate to your account within a single email to get rid of this problem. Conduct business and earn revenue without the need for any payments or credit card validations to ServiceLance. An extreme advantage for those who are in countries with limited or no access to credit cards. So do not worry, even if you have access to credit cards, you do not need to pull them out to exchange services. Messages & Alerts Direct to your Inbox! You don’t need to login every time to ServiceLance for checking updates, alerts or messages, instead ServiceLance brings them to you direct in your specified email inbox. Should you prefer not to receive the emails, you can easily modify your email preferences to opt out. If you know someone who wants to get a job done and think a ServiceLance provider can do it, just click on the tell a friend link on the Profile of this Provider and fill in the email details. ServiceLance will notify your friends and provide them a link to the Providers profile so your friends can either contact the Provider directly or post their Job to receive quotes. In order to keep the ServiceLance community ethical and to maintain respectability for all, abuse reporting is integrated at key locations within the site. Abuse reporting notifies ServiceLance management of abusive material on the site in order to initiate appropriate action. It is now affordable (i.e. Free) for individuals and businesses to provide expert services online without the hassles. ServiceLance provides all of its members with the flexibility to setup profiles, showcase track records, provide expertise, establish brands and grow, in a healthy and competitive environment. Interested in a job and not ready to quote on it yet but don’t want to lose out on the opportunity? - Simply add it to your Watch list. ServiceLance will notify you before the job expires so you can get in and quote for the job before it is too late. Based on how Providers setup their Profiles, the search results display relevant available Service Providers to those looking to get work done. All your nominated contact details are visible to those looking to access your services, hence further increasing your exposure and enabling you to provide services without restrictions. Most other sites on the internet today would block display of these details and even impose penalties on Service Providers for displaying contact details in order to force Service Providers to pay high fees. Receive Messages & your Activity Updates direct in your inbox! Don’t worry about your activity updates if you cant login to the site multiple times! ServiceLance will notify you of these updates and messages sent by other ServiceLance Users, right in your specified email inbox. Should you prefer not to receive the emails, you can easily modify your email preferences to opt out. You can also communicate with Service Seekers on their preferred mode of contact, to clarify job requirements to help you price jobs better. ServiceLance is not restrictive in its terms of service to you contacting the service seekers directly and performing the job. You are free to agree all your terms & conditions of contract & payment directly among yourselves. However ServiceLance only requires your valuable feedback in order to facilitate the development of a trustworthy community for exchange of services. You don’t need to have online merchant accounts, pay commissions to intermediaries or be restricted by which country you are in. Provide a quality service to your clients and get paid directly from the source without any loss of revenue. ServiceLance doesn't charge any commissions nor does it force you to use restrictive online merchant accounts. In addition to feedback from Seekers as a reputation indicator, you can write articles relevant to your areas of expertise to further establish your reputation. Writing relevant and useful articles prove to the reader that you are knowledgeable in your field. This raises your credibility and improves your chances of winning more jobs. All articles you write are prominently displayed in your profile. All information you provide within your provider profiles is unique and is specific to that profile. This means, for instance, that you can choose different contact details for each of the profiles so people can contact you on the correct contact details. Let your secretary handle the correspondence for one profile and let your brother handle correspondence for the other. Easy! Are you multi-talented or provide multiple services? Avoid creating multiple usernames and provide all your services from within one profile by creating multiple Provider profiles within one account and manage them all in one place. You don’t need to remember lots of login details, track multiple accounts or deal with loads of email alerts anymore. Furthermore, you can activate or deactivate profiles whenever you wish. Ever felt frustrated when you feel your service may fit into more than one sub-category? With ServiceLance, you can make yourself available to multiple sub-categories within each of your Provider profiles. This not only allows you to have maximum profile exposure but improves your chances of getting more relevant job alerts and grow your profits quicker. While almost all websites on the internet today are focused on IT related service exchange and freelancing, ServiceLance stretches user capabilities further to allow for not only IT but all types of services. Click here to take a look at the wide range of available service categories. Category selection when creating Provider Profiles could not be easier! Selecting categories can sometimes be a confusing task. You can type in relevant keywords and ServiceLance will provide you with category suggestions from which you can choose the most appropriate category for your profile. Alternatively, you can browse the entire list and pick the category yourself. Further, if you feel your profile matches more than one category, simple choose multiple categories. ServiceLance currently caters for a very vast set of categories and they have been carefully organized to make them easily accessible. Still can't find your relevant service category? Do not worry. Suggest your service category to us through our 'Suggest a Category' Form and we will gladly add it for you. Provider Search and Provider Profile displays your online / offline status. 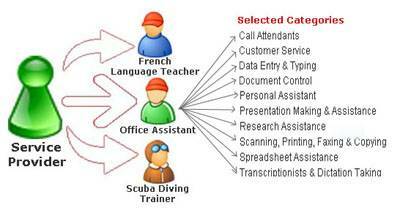 The Provider Search even has the capability to sort results by users that are online. Therefore Service Providers that are logged in are more likely to be contacted as they are able to respond to questions and quotes quickly. Stop searching for jobs of your interest as they now reach you themselves! On the basis of your profile settings of category, locations, services you provide and the profiles you setup, you will receive relevant job alerts on the site and in your email inbox. Check out the job, quote for it and win it. A complete list of available jobs can be accessed via the Search Jobs function. If you think you can do a particular job, add the relevant categories to your profile (if not already within your profile) and quote for it. Where seekers have posted Open jobs, you can easily see what other people are quoting before deciding what you would like to quote. Service providers can change minds if they decide to revise their quotes for the various possible reasons, such as competitiveness, over-quoting, under-quoting, etc. You can easily re-quote on jobs. Do a great job and seekers will provide you with great feedback. You can do the same for the seekers who award jobs to you based on your work experience with them. You can rate seekers on a range of targeted criteria. Provider feedback goes a long way in establishing ongoing reputation as a Service Provider. You can provide services from any country or city of the world. We have integrated a worldwide database of all major countries and cities throughout the globe. If your city is missing and should be on there, just let us know and we will gladly add it for you. Not available for services at any point of time? Don’t worry, you can deactivate your profiles temporarily or permanently. Deactivating profiles is extremely straightforward and can be done at any time which would take the profile out of the public view until you Reactivate the profile which can be done at any time. ServiceLance even recognizes that you may own a business in one area of expertise and yet have other skills that you may be willing to profit from. You can do all of that and more, all from within one user id. Households and businesses across the world today prefer to use services of individuals instead of businesses due to reduced costs, low overheads, flexibility and limited commitment - ServiceLance fits right in that gap for you so you can reap the benefits of this growing trend. You do not have to own a business to Provide your services any more (This may not be permitted in certain countries by law - Please abide by the law and use ServiceLance responsibly). Businesses are well set for moving into the 'Online Service Exchange' arena, further enhancing brands and identities. You will gain more exposure to potential clients, whether or not your business is an established one. Are you an individual who conducts business as a Sole Trader under a business permit? You can still reap all the benefits of ServiceLance and grow your business. It is now affordable (i.e. Free) for everyone to seek services online. Complete a simple form which is automatically filled in with your default details & your required job is ready to be posted. You can search, filter using specific criteria and view the profiles of Service Providers, but the excitement doesn't end at that. You can also grab their contact details and communicate with them directly, just like you would if you were browsing the providers own website. ServiceLance does not restrict contact details until you pay and therefore enables freedom for Service Seekers. ServiceLance is not restrictive in its terms of service to you contacting the Service Providers directly and getting the job done. You are free to agree all your terms & conditions of contract & payment directly among yourselves. However ServiceLance only requires your valuable feedback in order to facilitate the development of a trustworthy community for exchange of services. Since you do not have to process payment online via ServiceLance, you are not restricted to which currencies you would like to use. You have the freedom to use your local currency so you can exchange services in a currency that you understand and are comfortable with. You are no more restricted to a foreign currency and do not have to worry about complicated exchange rate risks. You may also choose from one of the major world currencies if you prefer. Your quotes are all sorted within the jobs themselves to assist you in managing them effectively. As a result the quotes don’t get cluttered on your screen and cause confusion. You can simply ignore quotes you are not interested in and they will be available for you under the Ignored Quotes tab incase you decide to revisit them. It is as easy as a mouse click to award the job to your preferred provider. This will then enable you to drop your valuable feedback for the provider. There can be disputes, genuine problems or misunderstandings, etc between the Seeker and Provider, in which case the award can be withdrawn and the Seeker can award the job to another provider that has already quoted for the job or accept additional quotes from Service Providers. ServiceLance allows you to specify unique contact details for each job. The contact information disappears from the Job page as soon as the job ends, in order to enhance Service Seeker privacy. There are no charges for posting sealed jobs. Sealed Jobs are those for which other Service Providers are not able to see the quotes you have received for your job. There are advantages and disadvantages to both Open and Sealed jobs and this depends on personal preferences. ServiceLance recommends posting open jobs to encourage competitiveness among the Service Providers. Are providers asking lots of questions that need clarifications? Think you have missed out on important details? Have you made an error in your job posting? Simply post a job clarification and all providers can view the clarifications. ServiceLance will automatically notify providers who have already quoted for the job. Every job has its own contact details, so you are not limited with the restrictions of the basic profile contact information. Let your secretary handle the correspondence for one job and let your brother handle correspondence for the other. You can also edit the contact details while the job is live. Easy! Selecting categories can sometimes be a confusing task. You can type in relevant keywords and ServiceLance will provide you with category suggestions from which you can choose the most appropriate for your job. Alternatively, you can browse the entire list and pick the categories yourself. Further, if you feel your job matches more than one category, simple choose multiple categories. Simply post a job with the relevant locations & contact details to get work done for your loved ones in their local areas of residence who may not be able to access the internet. Example, you may be living in New Zealand while your old mother lives in South Africa. You could assist her in getting her home plumbing fixed by posting a job which invites plumbers of the local area in India while you are in New Zealand. You do all the transactions and your mum relaxes that her son has dealt with her problem! In order to clarify job requirements and to assist you in making the right decision you can communicate with the Service Providers in any way you wish including the option of sending them a Personal Message through ServiceLance. ServiceLance will notify the Service Providers by sending them an email directly in their preferred email inbox so they do not miss out on your messages. Job Updates direct in your inbox! Don’t worry about updates on your posted jobs if you cant login to the site multiple times! ServiceLance will notify you of these updates and messages sent by other ServiceLance Users, right in your specified email inbox. Should you prefer not to receive the emails, you can easily modify your email preferences to opt out. Both you and Service Providers can provide feedback to each other, once the job has been awarded. You can rate Providers on a range of targeted criteria. Feedback goes a long way in establishing your ongoing reputation as a Service Seeker. You don’t need to have online merchant accounts, pay commissions to intermediaries or be restricted by which country you are in. You can pay Service Providers directly as per the terms agreed between yourselves. ServiceLance doesn't charge any commissions nor does it force you to use restrictive online merchant accounts.